Remember my post about ten unique and drool-worthy dishes at McKinley Hill? 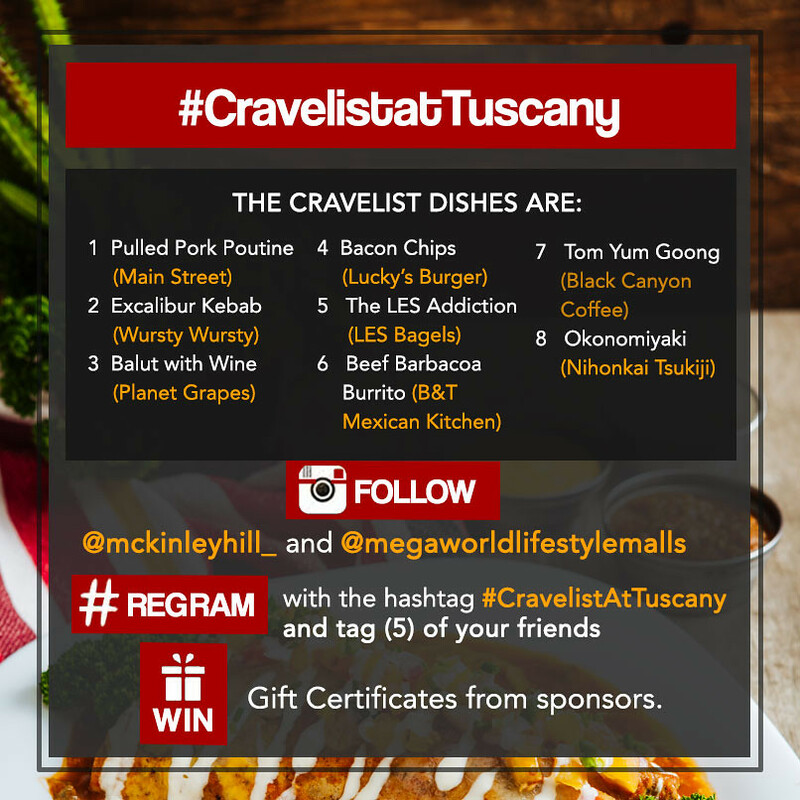 You can win GCs from these restaurants through the #CravelistatTuscany Instagram Contest. 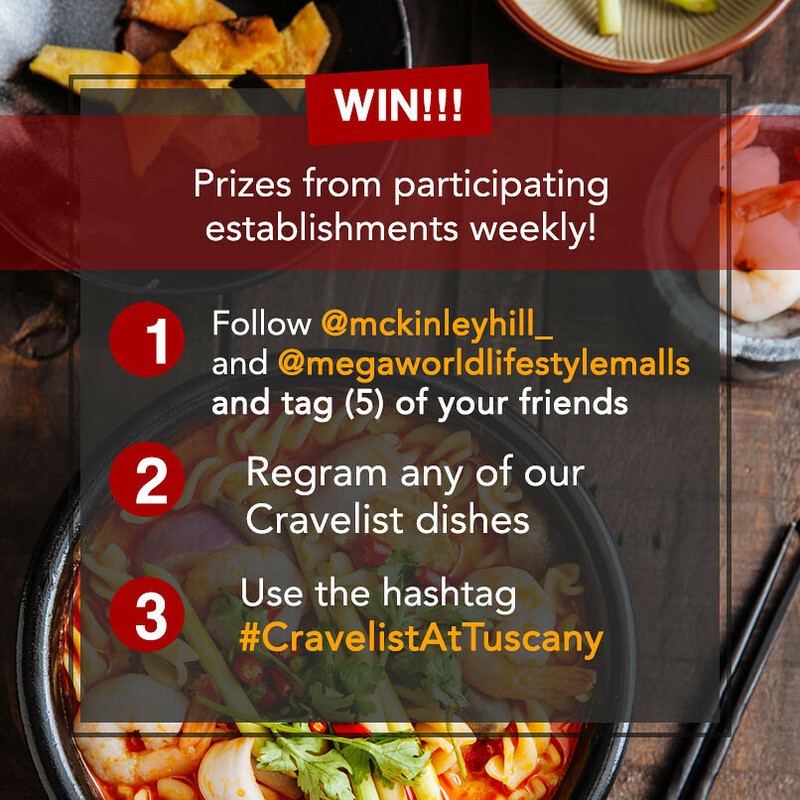 All you have to do is regram the featured Cravelist dishes for the week, tag five (5) of your friends, and include the official hashtag #CravelistatTuscany! 1. FOLLOW the official Instagram account of McKinley Hill @mckinleyhill_ and Megaworld Lifestyle Malls @megaworldlifestylemalls. 4. All tagged friends must FOLLOW the Instagram account of McKinley Hill and Megaworld Lifestyle Malls for the entry to qualify. 5. A Megaworld Lifestyle Mall Representative will decide on the winners. Ten winners worth PhP1,000 will be given at one of the participating restaurants. 6. Winners will be announced on the McKinley Hill Facebook and Instagram account. For more information on the Cravelist in Tuscany at McKinley Hill, you may call the Megaworld Lifestyle Malls Concierge at (02) 709-9888, 709-0888, or (0917) 838-0111. You can also visit their official website at http://megaworldlifestylemalls.com/ or Facebook page at https://www.facebook.com/megaworldlifestylemalls. Goodluck!